Bring your faulty iPhone into your local Apple Store and probably the first thing the technician behind the Genius Bar troubleshooting your device will do is check the status of Liquid Contact Indicator, which signals excessive exposure to water. This hidden tape strip reacts to moisture and can be found in your device’s headphone jack and charging port. The status of your warranty coverage depends on its color: if it is white, you pass, which means you are probably not responsible for replacement costs; if it is pink, your warranty is void, which can lead to expensive repair costs. Apple’s practice of not honoring its hardware warranty based on this practice led to a class action lawsuit against the company in California. Apple has reportedly agreed to pay up to the tune of $53 million in a settlement, nearly $16 million of which will go toward the legal counsel of the plaintiffs, and should be filed in a San Francisco federal court in the coming days, according to Wired.com. LL. “Settlement Fund” means $53,000,000 (fifty-three million dollars) in cash that Apple has agreed to deposit into a non-reversionary settlement fund that if FDIC-insured and administered by the Settlement Administrator, subject to the control and jurisdiction of the Court, from which all Settlement Class Members’ claims, all attorneys’ fees and litigation expense reimbursements sought by Class Counsel, and any incentive awards to Class Representatives will be paid. 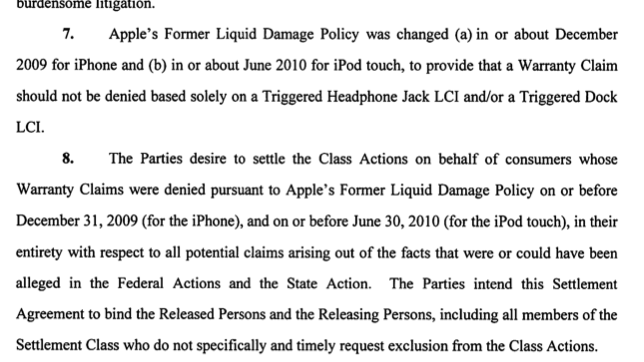 The settlement affects the original iPhone, the iPhone 3G, and iPhone 3GS, as well as the first and second generation iPod Touch. Read the leaked agreement acquired by Wired.com here.